Please come and join us at Level 18 The Majestic Centre for the monthly free Japanese movie night provided by the Embassy of Japan in Wellington! 2015 marks 70 years since the atomic bomb (Little Boy) was dropped on Hiroshima on August 6, 1945. Sadako’s story introduces a young girl whom many of you may have heard of as she has become a symbol for the innocent victims of war. 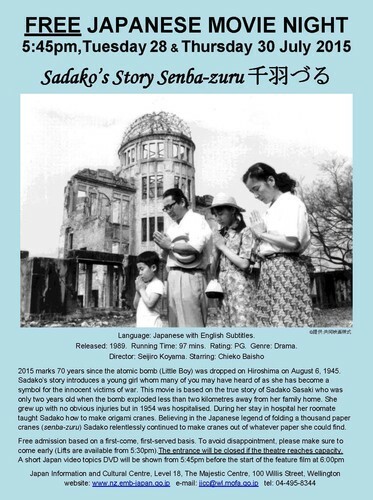 This movie is based on the true story of Sadako Sasaki who was only two years old when the bomb exploded less than two kilometres away from her family home. She grew up with no obvious injuries but in 1954 was hospitalised. During her stay in hospital her roomate taught Sadako how to make origami cranes. Believing in the Japanese legend of folding a thousand paper cranes (senba-zuru) Sadako relentlessly continued to make cranes out of whatever paper she could find. Free admission based on a first-come, first-served basis. To avoid disappointment, please make sure to come early (Lifts are available from 5:30pm). The entrance will be closed if the theatre reaches capacity. A short Japan video topics DVD will be shown from 5:45pm before the start of the feature film at 6:00 pm.